Except when it doesn't. And then I have to put my fingers on the keyboard and push buttons over and over again to explain the fact that I just love cookies that look old and dirty. Why aren't we living in the future where I can just think it in the direction of my computer? I mean... I'm lying on the couch with an electric blanket... I have to MOVE MY FINGERS, TOO??!! Clearly, I'm all about making things easier on myself. And when I got some of the Arty McGoo water brushes...I realized I was about to make my decorating life SO MUCH EASIER. I put together a set of Antiquing Water Brushes. It's not really a thing, but it *could* be a thing if you make it a thing. I'm just saying. You'll need two water brushes. Fill the barrels of both brushes with water. Add 3 drops of brown airbrush color and 1 drop of black airbrush color to ONE of the brushes. (If you don't have brown and black airbrush colors, mix 3 drops of brown food color and 1 drop of black food color with 2 tablespoons of water. Then add 3-4 drops of that mixture to the barrel of a water brush.) Now you're all set! See how easy that was? 1. To antique a cookie, grab the water brush with the brown/black mix in the barrel. Gently squeeze the barrel as you paint the food color mix into all the crevices and edges of the cookie. Don't squeeze too hard or you'll get great gobs of food coloring coming out just above the tip of the water brush. Just be nice. Like a first date. Maybe practice on a piece of paper first if you've never used a water brush. Or if you're impatient like me. 2. 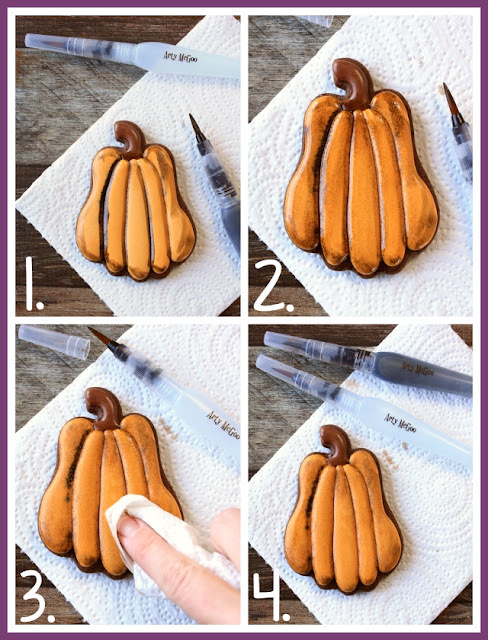 Grab the water brush that just has water in it and basically paint the entire cookie with water. You want to blend the harsh lines of the dark food coloring. Work quickly and don't worry about perfection. I mean..you want this cookie to look old, right? 3. Immediately wipe off the excess water with a paper towel. 4. Ta da!! Dirty old cookie at your service. 1. I *KNOW* someone is going to ask me "But won't water destroy my icing? I've heard you should only use alcohol." And my answer is -- water is fine as long as you don't let it puddle up on the cookie. And even if you do...and the icing starts to pit just a little...that's kind of the point, right? To make your cookie look old and a little the worse for the wear? 2. Make sure you cookies are COMPLETELY dry before aging them. I find it best to let them dry overnight first. Want your own Arty McGoo water brushes? I've got two "Antiquing Sets" of water brushes to give away!! Just click that "Easy Entry" button below before midnight on Friday, November 11, 2017. Can't wait to see if you've won? 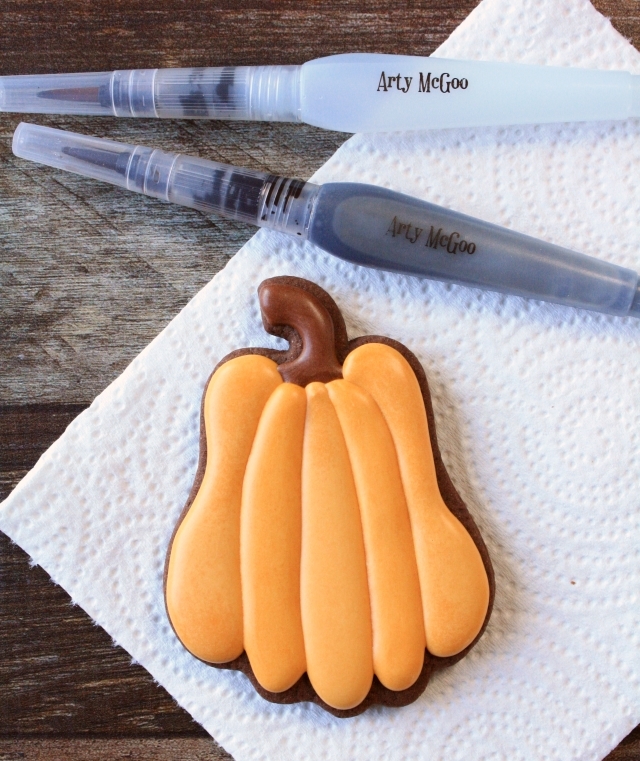 Grab an ARTY MCGOO WATER BRUSH HERE. See how to antique a cookie with luster dust HERE. 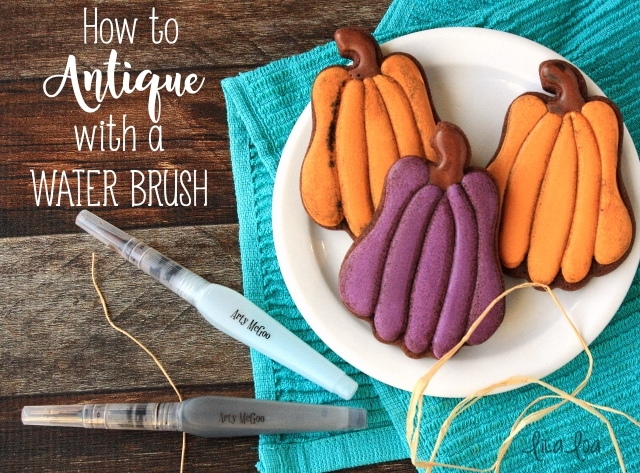 See how I antique a cookie with regular old food coloring and a brush HERE.